The 2014 King Fire burned 97,717 acres in the El Dorado National Forest and on private timberlands. The fires in these burn areas reduce the forest canopy, exposing snowpack to direct sunlight. This increases the rate of snowmelt and evaporation, impacting runoff and groundwater replenishment. Photo: Bonnie Dickson, USGS. Over the last several decades, both the incidence of large wildfires and the duration of the wildfire season across much of the United States have increased ( Westerling and others, 2006, American Water Works Assn, 2008; Finco and others, 2012 ). Future wildfire projections based on forecasted climate scenarios indicate both an increase in the expected severity of wildfires, and an expansion of wildfires over much of the northern hemisphere, particularly for western North America ( Liu and others, 2010; Liu and others, 2012 ). While the conditions that contribute to the intensity, size, and duration of wildfires are complex, scientists generally agree that the occurrence of wildfires will increase with climate change ( Batllori, E., Parisien, M.-A., Krawchuk, M. A. and Moritz, M. A., 2013 ). Warming trends, dry, drought-affected landscapes, and lower fuel moisture contribute to these affects. Studies have also linked climate change with post-fire coniferous tree mortality across the western United States, and – subsequently – an increase in wildfire fuel. This suggests a general – but often overlooked – relationship between climate and wildfire ( van Mantgem, P.J., Nesmith, J.C.B., Keifer, M., Knapp, E.E., Flint, A., Flint, L., 2013 ). The 2013 Rim Fire was the largest wildfire on record in the Sierra Nevada and the third-largest in California's history. The fire burned more than 257,000 acres of the Stanislaus National Forest, including the Tuolumne River, the largest tributary to the San Joaquin River. The Rim Fire threatened the Hetch Hetchy Reservoir, the main source of water for San Francisco and major parts of the Bay Area. Photo: Armando Robledo, USGS. Wildfire has many impacts on the hydrologic system and processes. Among these are changes in soil properties and removal of vegetation, both a result of fire intensity. Further, the potential loss of evapotranspiration from burned vegetation results in an increase in runoff as soil is no longer absorbing runoff water. 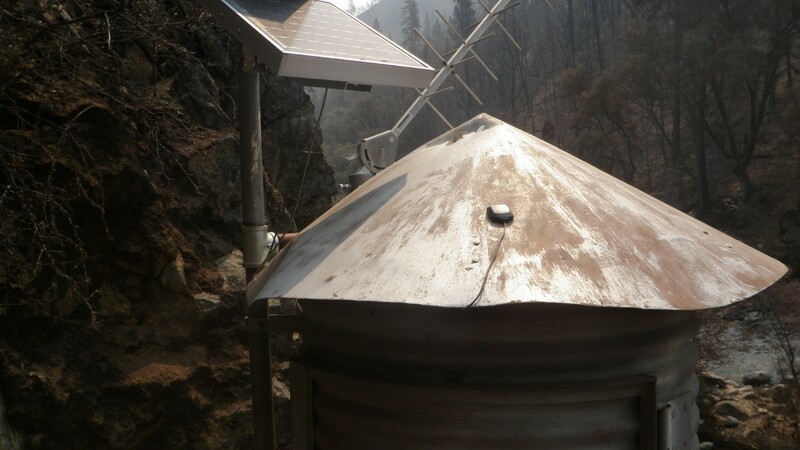 The USGS studies the influence of fire on hydrologic systems using the Basin Characterization Model (BCM). This USGS modeling software allows scientists to use future climate and precipitation scenarios to calculate how much water may be able to be absorbed by soil, and how much may simply run off the land's surface. The USGS and researchers at U.C. Berkeley are working together to better understand and assess the relationship between climate and wildfire in California using climate model scenarios. This research is part of wider efforts to develop real-time fire risk maps for California based on climatic stresses. A short film showcasing ongoing USGS research supporting agencies on the frontlines of fire management.